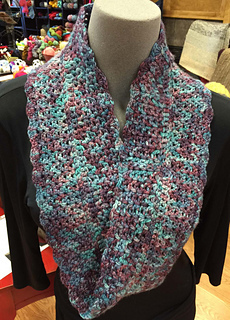 Crochet this classic V-Stitch cowl with a scalloped edge. Experience the magic of crocheting the moebius shape, which has a 180-degree twist, created at the very start of the project. It is a one-sided, one-edge object. 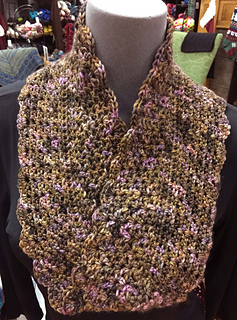 Instead of a traditional chain stitch, this project begins with the foundation double crochet method, which produces a relaxed beginning to the work. You are actually crocheting a chain and double crochet stitch at the same time as the stitches are crocheted in the foundation row. 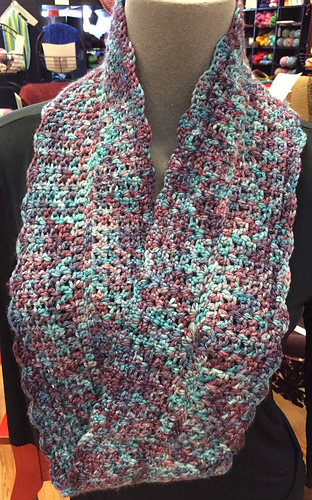 The double crochet is facing down as you are generating the stitches. Here is a link to an excellent video demonstrating this technique. 1 skein (210 yards) of madelinetosh Pashmina Worsted. Size H, 5mm crochet hook. Yarn needle. One locking stitch marker. Choose between two lengths. 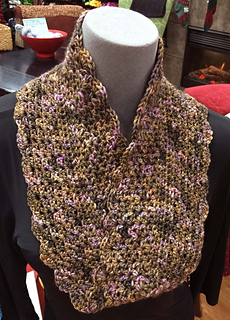 The cowl is approximately 31” in circumference x 5 ½ “ deep. 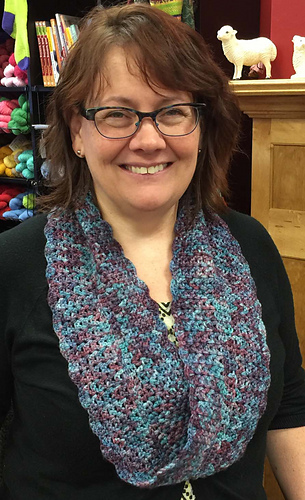 The longer cowl is approximately 35” in circumference x 5 ½” deep. Gauge is 4 stitches to an inch in V-Stitch pattern. This pattern was designed by Diane L. Augustin for All About Yarn for the Minnesota Yarn Shop Hop 2015.